The Kroger Co., or simply Kroger, is an American retailing company founded by Bernard Kroger in 1883 in Cincinnati, Ohio. It is the United States's largest supermarket chain by revenue ($115.34 billion for fiscal year 2016), the second-largest general retailer (behind Walmart) and the seventeenth largest company in the United States. Kroger is also the fifth-largest retailer in the world and the third largest American-owner private employer in the United States. Kroger is ranked #17 on the Fortune 500 rankings of the largest United States corporations by total revenue. As of March 2019[update], Kroger operates, either directly or through its subsidiaries, 2,764 supermarkets and multi-department stores. 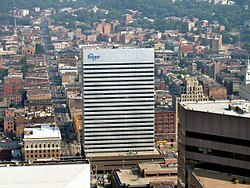 Kroger's headquarters are in downtown Cincinnati. It maintains markets in 35 states and the District of Columbia, with store formats that include hypermarkets, supermarkets, superstores, department stores, and 253 jewelry stores (782 convenience stores were sold to EG Group in 2018). Kroger-branded grocery stores are located in the Midwestern and Southern United States. Kroger operates 38 food processing or manufacturing facilities, 1,537 supermarket fuel centers, 2,270 pharmacies and 232 The Little Clinic in-store medical clinics. Kroger's employees are mostly represented by collective bargaining agreements and many are represented by the United Food and Commercial Workers (UFCW) union. In 1883, Barney Kroger invested his life savings of $372 to open a grocery store at 66 Pearl Street in downtown Cincinnati. The son of a merchant, he ran his business with a simple motto: “Be particular. Never sell anything you would not want yourself.” He experimented with making his own products, such as bread, so that customers would not need to go to a separate bakery. In 1884 Kroger opened his second store. By 1902, the Kroger Grocery and Baking Company had been incorporated. By this time, the company had grown to forty stores and sold $1.75 million worth of merchandise each year. In addition, Kroger became the first grocery chain to have its own bakery. In 1916 Kroger company began self-service shopping. Before this all articles were kept behind counters, and customers would ask for them, and then clerks would deliver them to customers. In 1929, it was rumored that Safeway would merge with Kroger. In the 1930s, Kroger became the first grocery chain to monitor product quality and to test foods offered to customers, and also the first to have a store surrounded on all four sides by parking lots. On May 13, Kroger entered the Houston, Texas, market by acquiring the Houston-based 26-store chain Henke & Pillot. In June of that same year, Kroger acquired the 18-store Krambo Food Stores, Inc. of the Milwaukee, Wisconsin, area. Back then, Krambo had started building six more stores. In late July, it purchased Childs Food Stores, Inc. of Jacksonville, Texas. Childs also had a presence in Arkansas and Louisiana. In January 1956, the company bought out Big Chain Stores, Inc., a chain of seven stores based in Shreveport, Louisiana, later combining it with the Childs group. All of these chains adopted the Kroger banner in 1966. During all the acquisitions, in September 1957, Kroger sold off its Wichita, Kansas, store division, then consisting of 16 stores, to J. S. Dillon and Sons Stores Company, then headed by Ray S. Dillon, son of the company founder. Kroger opened stores in Florida under the SupeRx and Florida Choice banners from the 1960s until 1988, when the chain decided to exit the state and sold all of its stores; Kash n' Karry bought the largest share. In the 1970s, Kroger became the first grocer in the United States to test an electronic scanner and the first to formalize consumer research. Although Kroger has long operated stores in the Huntsville-Decatur area of northern Alabama (as a southern extension of its Nashville, Tennessee, region), it has not operated in the state's largest market, Birmingham, since the early 1970s, when it exited as a result of intense competition from Winn-Dixie and local chains Bruno's Supermarkets and Western Supermarkets. Kroger built an ultra-modern dairy plant (Crossroad Farms Dairy) in Indianapolis in 1972, which was then considered the largest dairy plant in the world. Kroger exited Milwaukee in 1972, selling a few stores to Jewel. Kroger would later return in 2015 upon its acquisition of Roundy's. Kroger entered the Charlotte market in 1977 and expanded rapidly throughout the 1980s when it bought some stores from BI-LO. However, most stores were in less desirable neighborhoods and did not fit in with Kroger's upscale image. Less than three months after BI-LO pulled out, that company decided to re-enter the Charlotte market, and in 1988, Kroger announced it was pulling out of the Charlotte market and put its stores up for sale. Ahold bought Kroger's remaining stores in the Charlotte area and converted them to BI-LO. Kroger had a number of stores in the Western Pennsylvania region, encompassing Pittsburgh and surrounding areas from 1928 until 1984 when the U.S. began experiencing a severe economic recession. The recession had two significant and related effects on Kroger's operations in the region. One of them was that the highly cyclical manufacturing-based economy of the region declined in greater proportion than the rest of the U.S., which undercut demand for the higher-end products and services offered by Kroger. The second effect of the economic recession was to worsen labor-management relations, causing a protracted labor strike in 1983 and 1984. During the strike, Kroger withdrew all of its stores from the Western Pennsylvania market, including some recently opened "superstores" and "greenhouses," selling these stores to Wetterau (now part of SuperValu), who promptly flipped the stores to independent owners while continuing to supply them under the FoodLand and Shop 'n Save brands. Kroger's exit ceded the market to lower-cost, locally owned rivals, most notably Giant Eagle and the SuperValu-supplied grocers. (Kroger purchased Eagle Grocery company, whose founders went on to create Giant Eagle.) Kroger still maintains a presence in the nearby Morgantown, West Virginia, Wheeling, West Virginia, and Weirton, West Virginia/Steubenville, Ohio, areas where Giant Eagle has a much smaller presence and the SuperValu-supplied stores are virtually nonexistent, though in all of these cases, Walmart remains a major competitor and Aldi is the only other supermarket with any market overlap. Kroger entered the competitive San Antonio, Texas, market in 1980 but pulled out in mid-1993. On June 15, 1993, the company announced the closure of its 15 area stores. The chain closed several stores around Flint, Michigan, in 1981, which were converted by local businessman Al Kessel to a new chain called Kessel Food Markets. Kroger bought most of these stores back in 1999 and began reverting them. Several other Michigan stores were sold to another Flint-based chain, Hamady Brothers, in 1980. The Hamady acquisition was short-lived. In 1982, Kroger sold the 65-store Market Basket chain it had operated for several years in southern California. The stores were reverted to the Boys Markets branding, after acquiring the chain. Boys Markets was acquired by the Yucaipa Companies in 1989. When Yucaipa acquired Ralphs, the Boys brand disappeared. In 1983, The Kroger Company acquired Dillon Companies grocery chain in Kansas along with its subsidiaries (King Soopers, City Market, Fry's and Gerbes) and the convenience store chain Kwik Shop. David Dillon, a fourth-generation descendant of J. S. Dillon, the founder of Dillon Companies, became the CEO of Kroger. In northeastern Ohio, Kroger had a plant in Solon, Ohio, which is a suburb of Cleveland, until the mid-1980s. When that plant shut down due to high local union labor costs, Kroger closed its northeastern Ohio stores in the Cleveland, Akron, and Youngstown areas. Some of those former Kroger stores were taken over by stores like Acme Fresh Markets, Giant Eagle, and Heinens. Kroger opened and had about 50 stores in St. Louis until it left the market in 1986, saying that its stores were unprofitable. Most of its stores were bought by National, Schnucks, and Shop 'n Save. Kroger also experienced a similar withdrawal from Chattanooga, Tennessee, in 1989. Many of these stores were sold to the local grocery chain Red Food, which was in turn bought by BI-LO in 1994. Today, Chattanooga is the only metropolitan market in Tennessee in which Kroger does not operate. In the 1990s, Kroger acquired Great Scott (Detroit), Pay Less Food Markets, Owen's Market, JayC Food Stores, and Hilander Foods. Additionally, the Houston market was strengthened when Kroger bought several stores from AppleTree Markets, which were former Safeway stores in early 1994. In 1998, Kroger merged with the then fifth-largest grocery company Fred Meyer, along with its subsidiaries, Ralphs, QFC, and Smith's. In the late 1990s, it acquired many stores from Super Fresh as it exited many markets in the South. Kroger also swapped all ten of its Greensboro, North Carolina-area stores in 1999 to Matthews, North Carolina-based Harris Teeter, for 11 of that company's stores in central and western Virginia. Kroger still maintains a North Carolina presence in the Raleigh-Durham area. In the Raleigh-Durham area, Kroger closed its North Raleigh store in the Wakefield Commons shopping center on July 9, 2011, because the location failed to meet sales expectations. After the closure, Kroger will operate 16 stores in the Triangle. Kroger had a store in Greenville from the 1980s until 2010 when it sold it to Harris Teeter. A store in Wilson opened in 2002 but closed two years later. Long the dominant grocer in western Virginia, Kroger entered the Richmond, Virginia, market in 2000, where it competes against market leaders Martin's (including former Ukrop's stores) and Food Lion. Kroger entered the market by purchasing Hannaford stores that either already existed or were being built in Richmond. Hannaford purchases also included the competitive Hampton Roads market, where it now competes with Farm Fresh, Harris Teeter (which is owned by Kroger), and Food Lion. The Hannaford locations in these markets were purchased from Delhaize by Kroger as a condition of Delhaize's 2000 acquisition of the Hannaford chain, which had previously competed against Food Lion, also owned by Delhaize. Wal-Mart Supercenters are also major competitors in both markets, and the chain briefly competed against Winn-Dixie, which has now exited Virginia. In 2001, Kroger acquired Baker's Supermarkets from Fleming Companies, Inc.
Albertsons exited the San Antonio and Houston markets in early 2002, selling many of the Houston stores to Kroger. In 2004, Kroger bought most of the old Thriftway stores in Cincinnati, Ohio, when Winn-Dixie left the area. These stores were reopened as Kroger stores. In 2007, Kroger acquired Scott's Food & Pharmacy from SuperValu Inc., and in the same year, also acquired 20 former Michigan Farmer Jack locations from A&P when A&P exited the Michigan Market. In 2008, Kroger began a partnership with Murray's Cheese of New York City. Murray's Cheese counters within Kroger stores sell a variety of artisanal cheese from all parts of the world. On July 9, 2013, Kroger announced its acquisition of the 212 stores of Charlotte-based Harris Teeter in a deal valued at $2.5 billion and assumed $100 million in the company's outstanding debt. Harris Teeter's stores are in eight Southern states, with a major portion of them in its headquarters state of North Carolina. Doing so, Kroger acquired Harris Teeter's click and collect program which allows online ordering of groceries. Some industry experts see this as a competitive move against online grocers such as AmazonFresh. The Harris Teeter acquisition marked Kroger's return to the Charlotte market after a 25-year absence. It also allowed Kroger to enter Asheville for the first time. Charlotte and Asheville had been the only large markets in North Carolina where Kroger had no presence. In 2013, Kroger announced that the spouses of the company's unionized workers would no longer be covered by the company's insurance plan. The company cited the Patient Protection and Affordable Care Act as a prime reason for the move. The benefit cut affects roughly 11,000 workers in Indiana. The company announced in April 2013 that full-time employees would maintain their health insurance benefits. On March 3, 2015, Kroger announced it will enter Hawaii, having registered with the state as a new business in February 2015. The move had been in the planning stages, as it was planning to expand there in 2006 but withdrew after it had already submitted registration. Kroger, which is in the process of looking for locations to open its first store, will face competition from Honolulu-based rivals Foodland and Times; major retailers Safeway, Wal-Mart, and Costco; Japanese-owned Don Quixote; and Department of Defense-owned DeCA Commissaries. On May 1, 2015, Kroger announced the acquisition of the 7-store Hiller's Market chain in Southeast Michigan, and that it would operate all but one of those stores under the Kroger banner. In June 2015, Kroger eliminated the Harris Teeter brand from the crowded Nashville, Tennessee market, where its growth had been stunted by aggressive competition since it entered with six stores in the early-2000s. Kroger has traditionally had a market-leading presence in Nashville, and initially promised to keep the five remaining Harris Teeter stores open when it acquired the chain, but later said the market "did not support Harris Teeter's future business plans." Two Harris Teeter stores were closed outright, and three closed temporarily while being converted to the Kroger brand (one of these would undergo a major remodeling and replace a neighboring Kroger store). In April 2016, Kroger announced that it had made a "meaningful investment" in the Boulder, Colorado-based Lucky's Market, an organic foods supermarket chain that operated 17 stores in 13 states throughout the Midwest and Southeast United States. In February 2017, Kroger withstood large community protests after announcing the closing of two smaller-sized Louisville-area stores. Despite high store volumes and high population densities, the Old Louisville (lease expiration) and Southland Terrace stores closed. On February 7, 2017 it was announced that Kroger Co. had purchased Murray's Cheese. As of February 14, 2017, Kroger is no longer doing their discount for senior citizens 59 and up. On May 1, 2017, Kroger, along with the University of Kentucky and UK Athletics, sports and campus marketing partner JMI Sports, announced a 12-year, $1.85 million per year campus marketing agreement. Included in the agreement is the naming rights to Commonwealth Stadium, the university's football stadium, which will be renamed Kroger Field. This agreement makes the University of Kentucky the first school in the Southeastern Conference to enter into a corporate partnership for the naming rights to their football stadium. On May 10, 2017, Kroger opened its first convenience store in Blacklick, Ohio, labeled “Fresh Eats MKT.” The new prototype stores will have about 12,000 square feet of space, and will be very similar to the Walmart Neighborhood Market project, as these stores only sell food. These stores have a Starbucks, and a Kroger Pharmacy. On June 1, 2017, Kroger opened their second Fresh Eats. Kroger is also going to convert some Turkey Hill stores into the concept store. The CFO, Mike Schlotman, has called these stores a "small test." Local reaction to this new concept has been positive. In February 2018, Kroger announced that it will be selling its 762 convenience stores to EG Group, a British gas station operator, for $2.15 billion. They operate under the Turkey Hill, Loaf 'N Jug, Kwik Shop, Tom Thumb and Quik Stop banners. Kroger will retain just over 20 convenience stores. Kroger's supermarket fuel centers are not included in the sale. The sale was closed on April 20, 2018. On April 10, 2018, Kroger announced plans to hire an estimated 11,000 new employees. An estimated 2,000 managerial positions will be filled by the new hires. With the addition of these new hires, the total number of people employed by the company is close to half a million. On May 24, 2018, Kroger announced they were acquiring Home Chef for $200 million with an additional $500 million in incentives if certain targets are met by Home Chef. On June 13, 2018, Kroger Mid-Atlantic announced that they will be leaving the Raleigh-Durham area by closing and selling all 14 of their stores, 8 of which will become Harris Teeter stores. In July 2018, Kroger officials backed off a Net 90 payment plan to the produce industry. On December 4, 2018, Kroger announced a deal to sell food inside drugstore Walgreens. Kroger Express will offer meal kits and other meal solutions. For the fiscal year 2017, Kroger reported earnings of US$1.907 billion, with an annual revenue of US$122.662 billion, an increase of 6.4% over the previous fiscal cycle. Kroger's shares traded at over $142 per share, and its market capitalization was valued at US$24 billion in October 2018. Food 4 Less Foods Co.
Kroger Marketplace is a chain of big-box stores. The brand was introduced in 2004 in the Columbus, Ohio, area, which lost the Big Bear and Big Bear Plus chains in Penn Traffic's Chapter 11 bankruptcy. The Kroger Marketplace format is based on the Fry's Marketplace stores that the Arizona division of Kroger is currently operating. There are currently a total of 177 marketplaces. Similar to rival chains Meijer, Sears, Kmart, Target, Walmart, and Albertsons, and modeled after Kroger-owned Fred Meyer, these stores contain multiple departments. In addition to the grocery department, they usually contain a Fred Meyer Jewelers, Starbucks, Donatos Pizza, and an in-store bank, as well as sections for toys, appliances, home furnishings and bed and bath, something that Big Bear once had in their stores in the Columbus area. In 2005, the company began renovating many Kroger Food & Drug stores in Ohio for an expanded and remodeled look, converting them to the Kroger Marketplace format. In February 2006, Kroger announced plans for two new Kroger Marketplace stores to open by the end of the summer in Cincinnati suburbs Lebanon and Liberty Township. The store in Liberty Township opened in July 2006. On October 5, 2006, a new Kroger Marketplace opened in Gahanna. With the Gahanna opening, the number of Kroger Marketplace stores is six, four in the Columbus area and two in the Cincinnati area. Two more stores were planned in 2007, one in Middletown (which opened in April 2007, after the old store was razed and made part of the current parking lot) and one in Englewood. In 2011, the Elder-Beerman in Centerville, Ohio was demolished, and a new marketplace has been built in its place. It has a fuel center and opened on December 8. This marketplace is the largest Kroger store ever built from ground up to date at 147,000 square feet. Two more stores opened in the Cincinnati area, in the Northern Kentucky suburbs of Hebron and Walton which were completed in November 2008. Three Kroger Marketplace stores in Kentucky opened in 2009, two in Lexington and one in Newport. Another Marketplace opened in Beavercreek, Ohio. A Mount Orab, Ohio, store opened in the spring of 2010. Kroger opened a new 60,000 sq ft (5,600 m2) store in North Augusta, South Carolina. In 2015, a 145,000 square foot Marketplace was opened in the Cincinnati suburb of Oakley. Kroger Marketplace in Frisco, Texas opened in 2010. The first Kroger Marketplace store in Texas opened on October 9, 2009, in the Waterside Marketplace in Richmond, Texas. The second Kroger Marketplace store in Rosenberg, Texas, opened on December 4, 2009. The third opened in Frisco, Texas, in early 2010. The fourth, in Willis, Texas, opened on August 11, 2011. Other Kroger Marketplace stores in Texas are in Little Elm, Texas; Fort Worth's Alliance Town Center; Mansfield; Wylie, Texas; and Baytown, Texas. The first Kroger Marketplace store in Tennessee opened in Farragut, Tennessee (a small suburb near Knoxville) at the end of 2008, and a second store in Thompson's Station, Tennessee, about 20 miles (32 km) south of Nashville, opened in early 2009. A third location opened in Gallatin, Tennessee, on March 11, 2010. The first Kroger Marketplace in Arkansas opened in August 2010 on Chenal Parkway in Little Rock, Arkansas. Locations also opened in 2012 in Conway, Arkansas and 2014 in Jonesboro, Arkansas. The first Kroger Marketplace in Virginia opened on Midlothian Turnpike in Richmond, Virginia, on the site of the former Cloverleaf Mall on December 6, 2012. Another Marketplace opened in Virginia Beach, Virginia, at the site of a former Super Kmart, on July 31, 2013. The third location opened in December 2013 in the Staples Mill shopping Center in Henrico County. A fourth location opened on October 15, 2014, in Portsmouth, Virginia, at the site of the former I.C. Norcom High School. The first Kroger Marketplace in Mississippi opened on September 16, 2016 in Hernando to much fanfare. This store was formally a Kroger Food & Drug with twelve aisles, now rebuilt with sixty-four, in addition to having a Starbucks, ClickList, and expanded deli inside. The first Kroger Marketplace in Indiana opened on September 29, 2011, on Dupont Road on Fort Wayne's northwest side. This store is a rebuilt Kroger Food & Drug. A second Kroger Marketplace opened on October 4, 2012, from a rebuilt Scott's Food and Pharmacy in the Village at Coventry on the southwest side of Fort Wayne. These two stores are part of a $100 million expansion project in the Fort Wayne area. In October 2016, it was announced that a Kroger Marketplace will open in La Porte, Indiana within the NewPorte Landing development. Construction of the new 123,000 square foot store is expected to begin early in 2018. The first Kroger Marketplace in Michigan opened on June 14, 2013, at Sterns and Secor Roads in Lambertville (a small-sized suburb north of Toledo, Ohio). Formerly a conventional Kroger store, the square footage increased from 68,000 to 133,000 square feet. It carries toys, home essentials, apparel and shoes in addition to groceries. The state's second store opened in 2014 in Shelby Township on property that already contained a 2010-built Fuel Center, replacing a smaller Kroger store across Hayes Road in neighboring Macomb Township, which was soon converted into an Emagine Entertainment movie theater. A third location opened late in 2015 on 13 Mile Road in Roseville, rebuilt from a long-closed Kmart. Three further locations opened in 2016, one in White Lake on the site of what was once one of Kmart's "green" prototype stores and directly adjacent to the smaller Kroger store that this location replaced, a second Shelby Township location at 26 Mile Road and Van Dyke Avenue, and one at 12 Mile Road and Stephenson Highway in Royal Oak. A seventh location opened on Fort Street in Southgate on September 20, 2017. This store, which is a former Super Kmart, is the largest Kroger location in Michigan, with seventy aisles along with a small cafe section and dedicated ClickList parking spaces. In addition to stocking a variety of regional brand products, The Kroger Company also employs one of the largest networks of private label manufacturing in the country. Thirty-seven plants (either wholly owned or used with operating agreements) in seventeen states create about 40% of Kroger's private label products. Similar to most major supermarket retailers, Kroger uses a three-tiered private label marketing strategy. One private brand emphasizes no-frills products at the lowest possible price, another is intended to be comparable to leading national brands but a better value and the third is a premium (often organic) brand. Kroger's generic line of products was introduced in 1981 under the name of Cost Cutter and was known for its near-generic product labeling. It was then succeeded by FMV, which was a backronym to mean "For Maximum Value", originally meaning "Fred Meyer Value". In early 2007, Kroger replaced FMV with the Kroger Value brand. The Kroger Value brand was phased out in 2014. It offered staple products such as sugar, flour, bread and canned goods at the lowest price for that particular product in the store. Though some of these products (such as their cheese made with water and partially hydrogenated soybean oil) use a lower-quality manufacturing process, other products appear to be indistinguishable from their banner brand equivalent (P$$t… sugar and Kroger sugar, for example) other than the price. The P$$t…, Check This Out… and Heritage Farm brands were introduced in 2014. Kroger has expanded the line to many other items, such as bread, coffee, tea, ice cream, paper towels, bleach, dog and cat food, and other food and household items. Most Kroger Value brand items were bilingually labeled (in English and Spanish); however, the new P$$t…, Check This Out… and Heritage Farm are not. Banner Brands, goods that bear the name of Kroger or its subsidiaries (i.e., Ralphs, King Soopers, etc.) or make reference to them (i.e., Big K) are offered with a "Try it, Like it, or Get the National Brand Free" guarantee, where if the customer does not believe the Kroger brand product is as good as the national brand, he or she can exchange the unused portion of the product with their receipt for the equivalent national brand for free. Many of Kroger's health and beauty goods, one of the company's fastest-growing private label categories, are manufactured by third-party providers; these products include goods like ibuprofen and contact lens solution. Products marked Private Selection are offered to compare with gourmet brands or regional brands that may be considered more upscale than the standard Kroger brand products. Simple Truth Organic is a brand offered to compare with other organic brands with often simpler packaging and is becoming larger in 2014 as a part of Kroger's marketing. For the first time, Kroger is delving into making its own gluten-free products, including flour mixes, bread, etc. In 2006, Kroger partnered with the consumer products division of The Walt Disney Company to add the Disney Magic Selections line to its private label offerings. Kroger previously owned and operated the SupeRx drug store chain. In 1985, Kroger outbid Rite Aid for the Hook's Drug Stores chain, based in Indianapolis, Indiana, and combined it with SupeRx to become Hook's-SupeRx. In 1994, Kroger decided to exit the stand-alone drugstore business and sold its Hook's and SupeRx stores to Revco, which later was sold to CVS. Today, Kroger operates 2,271 pharmacies, most of which are located inside its supermarkets. The Kroger Pharmacies continue as a profitable portion of the business and have been expanding to now include pharmacies in City Market, Dillons, Fred Meyer, Fry's, King Soopers, QFC, Ralphs, Harris Teeter, Smith's Food and Drug, and Kroger Supermarkets. Since 1998, Kroger has added fuel centers in the parking lots of its supermarkets. More recently, the company has begun opening standalone fuel centers, often near stores whose parking lots could not accommodate a fuel center. As of Q2 2018, Kroger operated 1,523 supermarket fuel centers. In 2006, Kroger introduced a new common logo for all of its convenience store chains that is now also used at the fuel centers of all of its supermarket chains—a rhombus with a white, stylized image of the continental United States in the center bordered by four colored areas: dark blue representing the Pacific Ocean, red representing Canada, green representing the Atlantic Ocean, and yellow representing the Gulf of Mexico. Most Kroger locations feature Redbox movie rental kiosks. Previously, some Kroger locations featured kiosks from The New Release (aka Moviecube); most of these kiosks have since been replaced by Redbox kiosks. Also, until 2012, Kroger locations in the Columbus, Ohio, area featured kiosks by Blockbuster Express (originally DVD Play). Kroger operates its own fleet of trucks and trailers to distribute products to its various stores, in addition to contracts with various trucking companies. In June 2018, Kroger announced testing driverless cars for delivering groceries. For this, Kroger is partnering with autonomous car company Nuro. Kroger Personal Finance was introduced in 2007 to offer branded Visa cards; mortgages; home equity loans; pet, renter's and home insurance; identity theft protection; and wireless services. In 2011, Kroger dropped its contract with MasterCard and now offers store credit and debit cards through Visa. i-wireless is a national private label wireless service provider sold in over 2,200 retail locations within the Kroger family of stores across 31 states. The i-wireless service functions over the Nationwide Sprint Network. i-wireless created a loyalty offer allowing Kroger customers the ability to earn Wireless Rewards on select plans when using their shopper’s loyalty card on in-store purchases. Customers can choose from “Unlimited” rate plans-all including unlimited talk/text and with data allotments up to and including unlimited data. i-wireless invites customers to purchase phones at select Kroger store locations, via their website, or by bringing their eligible Sprint device for activation. In 2008, Greenpeace started ranking America's major supermarket chains on their seafood sustainability practices because, according to Phil Radford, Greenpeace U.S. CEO, "three quarters of global fish stocks are suffering from overfishing, and 90% of top marine predators are already gone." Criteria included the number of threatened fish species supermarkets sold, their seafood purchasing policies, and ocean legislation policies they supported. In 2013, Kroger was noted for carrying 17 out of 22 red list[clarification needed] species, four of which are top-tier red list species. In 2014, Moms Demand Action for Gun Sense in America, a national gun control organization backed by former New York Mayor Michael Bloomberg, began a campaign that seeks to pressure the Kroger chain to ban the open carry of firearms in all of its stores. The group decided to take action in response to demonstrations by open carry activists in Kroger stores in Ohio and Texas, and after conducting research that identified more than a dozen shootings on Kroger property since 2012. Kroger rebuffed their demand, stating, "If the local gun laws are to allow open carry, we'll certainly allow customers to do that based on what the local laws are. We don't believe it's up to us to legislate what the local gun control laws should be. It's up to the local legislators to decide to do that. So we follow local laws, we ask our customers to be respectful to the other people they are shopping with. And we really haven't had any issues inside of our stores as a result of that." ^ a b c d e f g h "Our Business - The Kroger Co". The Kroger Co.
^ "2015 Q4 2015 Earnings Release". The Kroger Co. Retrieved March 12, 2019. ^ a b "2013 Top 100 Retailers". STORES Media. July 2013. Retrieved December 17, 2013. ^ "Fortune 500 2017". CNNMoney.com. Retrieved February 17, 2018. ^ "Global Powers of Retailing 2013" (PDF). Deloitte. February 2013. p. G11. Archived from the original (PDF) on 17 December 2013. Retrieved 17 December 2013. ^ a b c d e "The Kroger Co. – Operations". Archived from the original on October 18, 2012. Retrieved February 28, 2013. ^ "Form 10-K: The Kroger Co". U.S. Securities and Exchange Commission. February 2, 2013. Retrieved December 17, 2013. ^ "Kroger Union Workers Vote to Reject Contract, Authorize Strike". Retrieved January 24, 2017. ^ "The Kroger Co. - Corporate News & Info: History". www.thekrogerco.com. Retrieved October 29, 2018. ^ "First Kroger Opened 90 Years Ago". Times Daily. August 26, 1973. Retrieved November 28, 2015. ^ a b "Kroger Company - Ohio History Central". www.ohiohistorycentral.org. Retrieved August 23, 2018. ^ "Kash N' Karry Buys Markets From Kroger". Articles.orlandosentinel.com. August 24, 1988. Retrieved January 3, 2013. ^ "Kroger Lines Up Buyers". Articles.orlandosentinel.com. September 7, 1988. Retrieved January 3, 2013. ^ "Business Scene: Kroger Co". News.google.com. Retrieved January 3, 2013. ^ "Advertisement – Final Clearance". The NEws and Courier. January 4, 1989. p. 10-A. Retrieved January 3, 2013. ^ "Kroger Selling Stores in Strike". The New York Times. February 14, 1984. ^ "Kessel buys Corunna, Saginaw Kroger Stores". The Argus-Press. November 24, 1981. p. 1. Retrieved January 3, 2013. ^ File Photo. "Grocer Al Kessel remembered for kindness, dedication to employees". MLive.com. Retrieved January 3, 2013. ^ "Kroger selling Manistee store". Ludington Daily News. June 28, 1980. p. 1. Retrieved January 3, 2013. ^ "Hamady Sacks and Yankee Hats". Archived from the original on December 20, 2012. Retrieved October 22, 2013. ^ "828 F.2d 19". resource.org. September 3, 1987. ^ Canedy, Dana (October 20, 1998). "Kroger to Buy Fred Meyer, Creating Country's Biggest Grocer". The New York Times. ISSN 0362-4331. Retrieved January 24, 2017. ^ Blanford, Andrea (October 20, 2010). "Harris Teeter moving into Greenville Kroger". WNCT-TV. Retrieved December 17, 2013. ^ "Kroger Press Release, May 31, 2000". Thekrogerco.com. May 31, 2000. Retrieved October 22, 2013. ^ "FTC Agreement Allows Delhaize America, Inc. and Hannaford Bros. Co. Merger of East Coast Supermarkets". Ftc.gov. June 24, 2011. Archived from the original on February 19, 2013. Retrieved January 3, 2013. ^ Reports, WANE Staff (October 5, 2016). "Kroger kicks off 38th annual Fight Cancer Day". WANE. Retrieved January 24, 2017. ^ Lippman, Daniel (January 16, 2014). "Not Your Grandmother's American Cheese". The Wall Street Journal. Retrieved April 29, 2014. ^ Clifford, Stephanie (July 9, 2013). "Kroger Buys Rival Grocer Harris Teeter, Citing Potential for Growth". New York Times. Retrieved July 11, 2013. ^ "Mid-Market Grocers Continue to Struggle in Fiercely Competitive Sector". National Real Estate Investor. Retrieved July 11, 2013. ^ Epstein, Joseph. "Kroger workers' union OKs dumping spouses into Obamacare". WashingtonExaminer.com. Retrieved October 22, 2013. ^ "Obamacare effect? Kroger cuts health care for Indiana workers' spouses". Archived from the original on September 8, 2013. Retrieved October 22, 2013. ^ Berman, Jillian (April 13, 2013). "Most Employers Won't Drop Health Care Coverage Because Of Obamacare: Survey". Huffingtonpost.com. Retrieved October 22, 2013. ^ "Kroger Acquires Hiller's in Metro Detroit". ProgressiveGrocer. ^ Alfs, Lizzy (June 9, 2015). "Harris Teeter's equipment, fixtures up for auction". The Tennessean. ^ Williams, William (July 9, 2013). "Local Harris Teeter stores to stay open once Kroger deal complete". NashvillePost.com. Archived from the original on April 15, 2015. Retrieved April 8, 2015. ^ Alfs, Lizzy (April 7, 2015). "Harris Teeter closing Nashville stores, converting 3 to Kroger stores". The Tennessean. Retrieved April 8, 2015. ^ Apel, Kara (April 7, 2015). "Harris Teeter closing 4 stores in Nashville; 3 being sold to Kroger". WSMV.com. Archived from the original on February 3, 2018. Retrieved January 5, 2019. ^ "Kroger & Lucky's Market Announce Strategic Partnership". PR Newswire (Press release). April 1, 2016. ^ CNBC (January 23, 2017). "Supermarket chain Kroger to fill 10,000 permanent positions". CNBC. Retrieved January 24, 2017. ^ Baddour, Dylan (February 17, 2017). "Kroger ends senior citizens discount". Houston Chronicle. ^ "Kroger to unveil new convenience concept". Supermarket News. May 9, 2017. Retrieved January 11, 2018. ^ CNBC (February 5, 2018). "Kroger to sell its convenience stores to UK's EG Group for $2.15 billion". CNBC. Retrieved February 7, 2018. ^ "Kroger and EG Group Announce Definitive Agreement for Purchase of Kroger's Convenience Store Business". Kroger. Retrieved March 28, 2018. ^ "EG Group Goes West With Fuel Retail Convenience Model – EG Group". www.eurogarages.com. Retrieved August 23, 2018. ^ "Kroger Hiring 11K For Supermarket Divisions". Progressive Grocer. Retrieved April 12, 2018. ^ Editorial, Reuters. "Kroger to hire 11,000 employees to its supermarkets". U.S. Retrieved April 12, 2018. ^ "1,500 expected to lose jobs as Kroger closes all stores in Raleigh, Durham". ^ "Kroger Backs off "Net 90" Payment Plan to Produce Shippers - California Agriculture News - California Agriculture". californiaagtoday.com. Retrieved August 23, 2018. ^ "Kroger to Sell Groceries in Walgreens Stores". Retrieved December 4, 2018. ^ Lucas, Amelia. "Walgreens, Kroger expand partnership, testing Express grocery shops". www.cnbc.com. Retrieved December 4, 2018. ^ "Kroger Revenue 2006-2018 | KR". www.macrotrends.net. Retrieved October 31, 2018. ^ The Kroger banner encompasses the following divisions: Atlanta, Central, Cincinnati, Columbus, Dallas, Delta, Houston, Louisville, Michigan, Mid-Atlantic, and Nashville. ^ "Kroger to withdraw", United Press International in The Bryan Times, August 29, 1985. ^ Locations sold to DeLano's IGA, last Kroger-owned location closed in 2011. ^ Acquired July 1955, name phased out in 1966. ^ Gonzales, J.R. "Houston's own Henke & Pillot Archived February 10, 2015, at WebCite." Houston Chronicle blogs. October 20, 2010. Retrieved on January 13, 2011. "Offices at 3021 Washington"
^ Acquired 1998, sold to Schnucks in 2011. ^ Acquired and name phased out in 1999. ^ Acquired June 1955, name phased out in 1966. Withdrew from Wisconsin in 1971. ^ Acquired October 1963, sold in 1982. ^ Acquired in 2007, final location became a Kroger in 2016. ^ Showalter, Kathy (November 8, 2004). "Kroger hopes Graceland store is Wal-Mart antidote". www.bizjournals.com. Retrieved July 31, 2017. ^ Warner, Melanie (October 6, 2005). "An Identity Crisis for Supermarkets". The New York Times. ISSN 0362-4331. Retrieved January 24, 2017. ^ "Kroger KEEPS LEAD". www.enquirer.com. Retrieved January 24, 2017. ^ "Kroger Marketplaces coming". The Cincinnati Enquirer. February 27, 2006. Retrieved October 1, 2006. ^ "Kroger casts net more broadly". The Cincinnati Enquirer. July 19, 2006. Retrieved October 8, 2006. ^ Schwartzberg, Eric (July 13, 2006). "Colossal Kroger set to open soon". The Western Star. Archived from the original on November 5, 2006. Retrieved December 17, 2013. ^ "Biggest Kroger Marketplace to open in Centerville". www.daytondailynews.com. Retrieved January 3, 2013. ^ "Beavercreek Approves New Kroger Marketplace Store". www.whiotv.com. Retrieved January 3, 2013. ^ Biggest Kroger store ever opens Thursday in Oakley Cincinnati Enquirer. September 10, 2015. ^ "Kroger Marketplace to Open First and Largest Store in Texas". Progressive Grocer. 26 May 2009. Archived from the original on 18 December 2013. Retrieved 17 December 2013. ^ "Work to begin on Kroger Marketplace – Fort Bend Herald: News". Fbherald.com. September 3, 2008. Retrieved January 3, 2013. ^ a b "Kroger in Frisco to sell not only food, but the dining table, too | wfaa.com Dallas – Fort Worth". Wfaa.com. January 21, 2010. Archived from the original on October 31, 2012. Retrieved January 3, 2013. ^ Micek, Kassia (August 12, 2011). "First Kroger Marketplace in Montgomery County opens in Willis". Courier of Montgomery County. Retrieved December 17, 2013. ^ "Mayor Hogue Delivers State of the City Address" (PDF). City of Wylie Living. March 2012. p. 1. Archived from the original (PDF) on November 15, 2012. Retrieved January 3, 2013. ^ Shapiro, Carolyn (May 22, 2012). "Kroger store on tap at former Va. Beach Kmart site | HamptonRoads.com | PilotOnline.com". HamptonRoads.com. Retrieved January 3, 2013. ^ Herndon, Dave (September 21, 2017). "Kroger's largest Michigan store opens in Southgate". Southgate News-Herald. Retrieved October 29, 2017. ^ "Plants – Grocery". Inter-American Products. Retrieved January 3, 2013. ^ "Three-Tier Marketing Strategy". Kroger. Archived from the original on October 23, 2013. Retrieved December 17, 2013. ^ Thakker, Krishna (July 10, 2018). "Grocery giant Kroger tries on a new outfit with apparel line". Food Dive. Industry Dive. Retrieved July 29, 2018. ^ "Kroger introduces Disney Magic Selections in stores nationwide". The Kroger Co. Retrieved October 8, 2006. ^ "Our History". Indianapolis, Indiana: Hook's Drug Store Museum and Soda Fountain. Retrieved December 17, 2013. ^ "Pharmacy Careers". Kroger. Retrieved December 17, 2013. ^ "Standard Vendor Agreement for Merchandise (Products)" (PDF). Kroger. January 2013. Archived from the original (PDF) on 17 December 2013. Retrieved 17 December 2013. ^ Hirsch, Lauren (June 28, 2018). "An unmanned car may soon deliver your Kroger groceries". CNBC. Retrieved June 29, 2018. ^ "Kroger to test grocery delivery using driverless vehicles". USA TODAY. Retrieved June 29, 2018. ^ "KPF:1-2-3 Rewards® Visa Card". 123rewardscard.com. January 1, 1980. Retrieved January 3, 2013. ^ a b Woyke, Elizabeth (June 16, 2008). "Avoid The Big Carriers!". Forbes. Retrieved November 6, 2018. ^ Chakravarti, Jayant (May 2, 2016). "Sprint, i-wireless Merger To Heat Up Lifeline Services". AH. Retrieved November 6, 2018. ^ "Kroger Shoppers Earn Free Wireless Just for Shopping". PR Newswire. December 15, 2009. Retrieved November 6, 2018. ^ "Plans". www.krogeriwireless.com. Retrieved November 6, 2018. ^ "i-wireless Phones". shop.krogeriwireless.com. Retrieved November 6, 2018. ^ "Bring Your Own". www.krogeriwireless.com. Retrieved November 6, 2018. ^ "General situation of world fish stocks" (PDF). United Nations Food and Agriculture Organization (FAO). Retrieved November 6, 2013. ^ "Protecting our oceans, one supermarket at a time". The Seek Radio. Retrieved October 13, 2013. ^ "Carting Away the Oceans" (PDF). Greenbiz.com. Retrieved July 20, 2013. ^ "Carting Away the Oceans 7" (PDF). Greenpeace. Archived from the original (PDF) on October 21, 2013. Retrieved November 2, 2013. ^ "Kroger Under Fire From Gun-Control Moms". Huffington Post. Retrieved February 19, 2015. ^ Xu, Daniel. "Kroger Executive Stands Firm Against Group's Demand to Ban Guns from Store". OutdoorHub. Retrieved March 30, 2015. Wikimedia Commons has media related to Kroger.